We’ve all heard of winemaker dinners and wine and food pairings but with all the great Craft breweries popping up, so are the beerbrewer dinners and beer and food pairings. 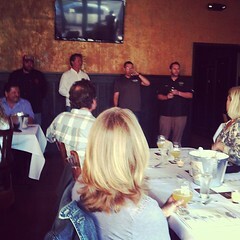 As you know I’ve really started getting into the Craft beer experience as a result of SLO Craft Beer week, and the other night attended our first beerbrewer’s dinner put on by Hangar 24 Brewery in conjunction with Central Coast Distributing (CCD) at Rooster Creek a local restaurant. Located in Redlands, California, Hangar 24 is named for the hangar that owner and master brewer Ben Cook, used to visit with friends to share his home-brewed beer, and banter about aviation after an afternoon of flying. Since then, he’s opened his own brewery and created some unusual beers and delicious ales. Our tour guides for the evening were Josh Gould from Hangar 24, Bryan Rounds from CCD and Chef Jason Gable who put together a 5 course meal and expertly paired each with a different Hangar 24 beer. We started with a local farmed Morro Bay oyster trio with a cucumber and onion horseradish, lavender creme and crispy shallot crumbs paired with the Orange Wheat which I liked a lot. This beer was straw-colored and had a soft mouth feel even though it was the most highly carbonated beer of the evening. They make this beer with the local Valencia oranges that grow within 2 miles of the brewery, and are added during the brewing process. The Belgian Summer Ale one of their Seasonal offerings was served with a coconut and lemongrass broth with a salted prawn and fried yucca strips. The broth was really good, rich and spicy and balanced by the beer’s banana notes. Along with the banana there are notes of pineapple, cloves and strangely bubblegum. The beer had a beautiful golden color and really brought out the lemongrass flavor in the broth while helping cool the spice. Course 3 was a spicy pickle plate of seasonal vegetables, smoked sea salt, and crushed peppercorns. This puppy was HOT! And the Double IPA it was served with didn’t help AT ALL! In fact the heavy hops with an International Bittering Units (IBU) of 118, makes this beer very bitter and it made the pickles even hotter. If you are looking for something to cool the burn a bitter beer won’t do it, something on the sweeter side is a better way to go. The old saying sweet beats heat would definitely work here. The Double IPA is made with 5 malts and 70 pounds of Orange Blossom honey! Even with the heavy bitter hops the beer is really quite balanced. Chef also served a slice of “No woman, No cheese” a savory cheese made with Jamaican jerk seasoning that had the Bob Marley song “No woman, No cry” swirling around my head for the rest of the night. Dinner was a Moroccan coffee crusted, lamb lollipop, caramelized cauliflower puree and black tea smoked demi served with the Hangar 24 Palmero. A traditional Abbey Dubbel (Belgian Double) beer it is beautiful amber in color and made with dates from the Cochella Valley. The malt is the star in this beer and is only further highlighted by the use of local ingredients. You can definitely taste the sweetness of the dates when drinking Palmero, which is named for the person who cares and tends the palm trees and picks the dates. For dessert we were served a Nueske bacon (from an 1863 Wisconsin recipe) studded maple ice cream, espresso griddle cake and macerated cherries paired with a Chocolate Porter. Now what made this Chocolate Porter unique is that we were treated to the “Nitro” experience, which they almost never do. Nitro is short for nitrogenated which is a method in which nitrogen is injected into the carbonation process as opposed to the standard carbon dioxide. The Nitro process makes the beer completely different then the carbon dioxide process. Because it produces smaller to no bubbles the beer becomes richer, creamier and softer, topping it with a fluffy white head. It reduces the bitterness and allows the malt to shine. Even with a rich, creamy mouth feel the beer is not heavy. We were lucky enough to be able to do a side by side comparison of the nitrogenated Porter with a bottle of the Porter. It was astounding how drastic the difference was. While the nitrogenated Porter was smooth and silky with little to no bubbles and had a mild bitterness, the bottled Porter was pricklier with bigger bubbles, more bitterness and was just a more harsh experience all around. I definitely preferred the Nitro version and was glad I got to get a real education when it came to comparing the two. 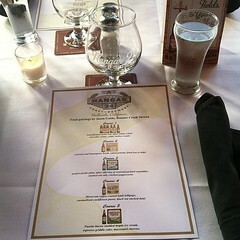 I really enjoyed my evening with Hangar 24, I learned so much from their staff and the food was great. If you are a beer person or even a wine person when there is a beerbrewer dinner in your area, make sure you go check it out. It’s really fun, and for the wine pairers out there it’s an unusual experience to see how differently food can pair with beer and so nicely too. Yakitori – Buy American, Eat Japanese.